Frances Kathryn Farley, 86, of Marietta, Ohio, died Sunday, September 2, 2018 in Marietta. She was born on November 30, 1931 in Lowell, Ohio, to Frank Leo and Virginia Meiser Offenberger. Frances was a 1950 graduate of Waterford High School. She was an insurance clerk and receptionist for Dr. Robert Rudolph and Dr. Se Hivan Whang, for over 20 years, retiring in 1996. Frances was a member of St. John the Baptist Catholic Church in Churchtown, where she was a member and the Catholic Women's Club and Senior Citizens Club as well. She is survived by one daughter, Diane Lee-Trotter (Ed) of Marietta; two grandsons, Tristan Lee (Emily Cooperrider) of Pataskala, and Brysen Lee (Gretchen) of Barlow; three great grandchildren, Isaac, Aubrey and Greysen; and many nieces and nephews. She was preceded in death by her husband, Robert Eugene Farley, whom she married on February 4, 1954; brothers, Harold, Paul, Arthur, Frank Jr., Bernard Offenberger and two infant brothers; and sisters, Marie Newlon, Leora Beck and Winifred Strauss. Funeral Liturgy with Mass will be at 10:00 a.m. on Thursday, September 6, 2018 at St. John's in Churchtown, with The Rev. Timothy Davison celebrating. Burial will follow in the church cemetery. Visitation will be on Wednesday, from 2 to 4 and 6 to 8 p.m. at the Marietta Chapel of Cawley & Peoples Funeral Home, with a Vigil service being held at 3:00 p.m. Her family would like to thank Comfort Keepers, Marietta Home Health and Hospice and all the staff and residents at the County Home for all their care and compassion. Donations may be made to St. John's School Foundation, 17784 St. Rt. 676, Marietta, Ohio 45750. Cawley & Peoples is honored to serve Frances' family and offers online condolences and many more resources by visiting their website, www.CawleyandPeoples.com . 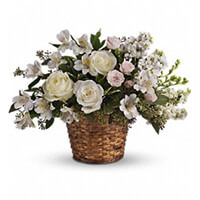 To send flowers to the family of Frances Kathryn Farley (Offenberger), please visit our Heartfelt Sympathies Store. Rest in peace Aunt Frances , you will be missed very much by your family , friends and all who knew you . Many will miss you at family reunions and miss the love you gave everyone that you talked to . To Diane and family I feel the sorrow you are feeling loosing such a special lady in everyone's lives.